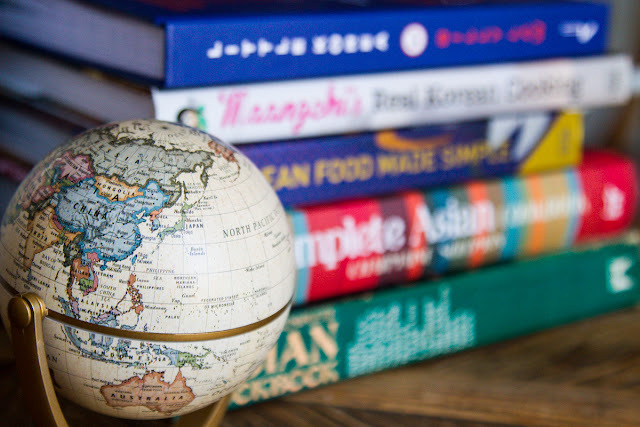 It has been too long since I have dedicated a whole week to cooking one cuisine so I set my mind to the task and I scanned my cookbooks, so much choice, so many good books, so many exciting cuisines and then my eye settled on my Korean cookbook collection. Three books in total wholly dedicated to one cuisine and I hadn't made a single thing from any of them. What a crime. There was a reason I hadn't actually cooked from any of them and it was total intimidation. We had eaten at Korean restaurants but stuck to the tamer side of the menu, Korean Fried Chicken mainly! But the Korean penchant for fermentation and the long lists of hard to find ingredients had kept me away from cooking it myself. 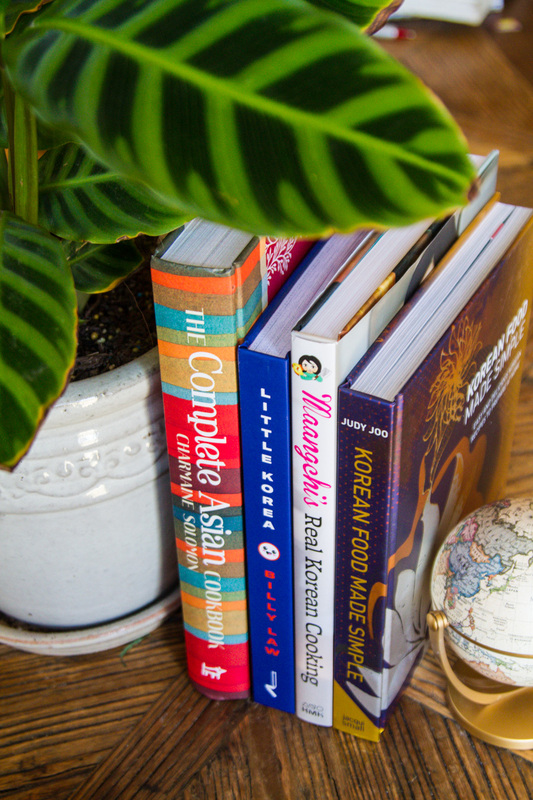 Facing your fears is a good philosophy to have so with that in mind I sat down with my Korean cookbook collection to peruse the options. The tamest of the beasts was Little Korea by Billy Law. Working from books written for an Australian audience always simplifies things. The ingredients are based around those available here (be it in regular supermarkets or Asian groceries). Chillis for example, in an American cookbooks they are often based around the readily available Mexican varieties whereas Australian books focus on the south east asian chillis available in a regular supermarket. It also turned out to be one of those books where I was more excited than intimidated by many of the recipes, they are presented in a straightforward fashion all achievable by the home cook. 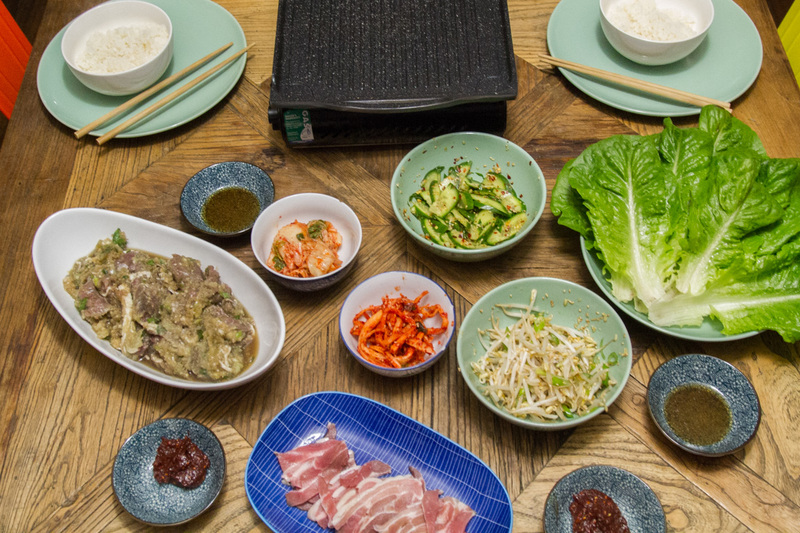 I knew I had to select some banchan as they seem to be the cornerstone of Korean cooking and if you have ever been to a Korean restaurant are the strange little dishes placed on the table before the meal, essentially tiny side dishes. We had these with beef bulgogi (from Maangchi's book, see below) and grilled pork belly which we cooked on the grill on a burner at the table. I just love cooking your own food at the table. The bulgogi was served with lettuce leaves to wrap it in and a spicy dipping sauce called ssamjang and the pork was accompanied by a salt and pepper dipping sauce called Gireumjang which primarily consisted of sesame oil (like much Korean cooking I was to find out). We also cooked Billy's Korean fried chicken with sweet and spicy sauce (Yangnyeam in Korean) and really you can't go wrong with deep fried chicken, equal parts sweet and spicy it was succulent and delicious. We served this with a very odd ingredient that I have never heard of before, pan fried spicy rice cakes. They were a little tricky to find but so glad we hunted them down. Their chewy texture works great with the spicy char this recipe calls for when cooking. One of my favourite recipes from Billy's book was the stir-fried spicy pork, a pretty tame place to start for a novice to Korean food and very easy to whip up for a weeknight dinner. I was surprised to see pork shoulder recommend as the cut of meat, I have never used pork shoulder in any other form other than slow cooking and thinly sliced as called for in this recipe and stir fried it was so good. A little more chew than say tenderloin but with more flavour which stood up well against the main seasoning, gochujang which is a chilli paste you will come to know well if cooking Korean food. I also ended up making Spicy Garlic Fried Chicken (Kkanpunggi). It wasn't in the original plan but when I was done with all the recipes I had planned out I had enough left over ingredients to make this Korean spin on Kung Pao Chicken which is one of my all time favourite Chinese dishes. This was another absolute cracker of a dish. Easy weeknight cooking that packed a real bang of flavour. The next go to book was Korean Food Made Simple by Judy Joo and whilst I liked the look of a lot of the recipes here there wasn't quite as many that really excited me. I decided to go for a stew as I had been wanting to try a Korean stew at a restaurant but had not yet had the chance. Turns out the pork and kimchi stew was the highlight of the week. I was expecting something with much more fermented funk due to the kimchi but it turned out so sweet with the perfect level of spice. I rarely eat tofu and it's silky texture was perfect with the chewy pork belly and crunchy cabbage.I think I actually preferred the tofu to the pork. It was lucky I did enjoy it, much like the stir fried pork, there was so much in the way of leftovers I ended up eating it for lunch for days. If you are looking for a real reference book to get you started cooking Korean then Maangchi's Real Korean Cooking covers lots more than just recipes. As a well known writer of a Korean cooking blog and Korean native Maangchi really knows her stuff. 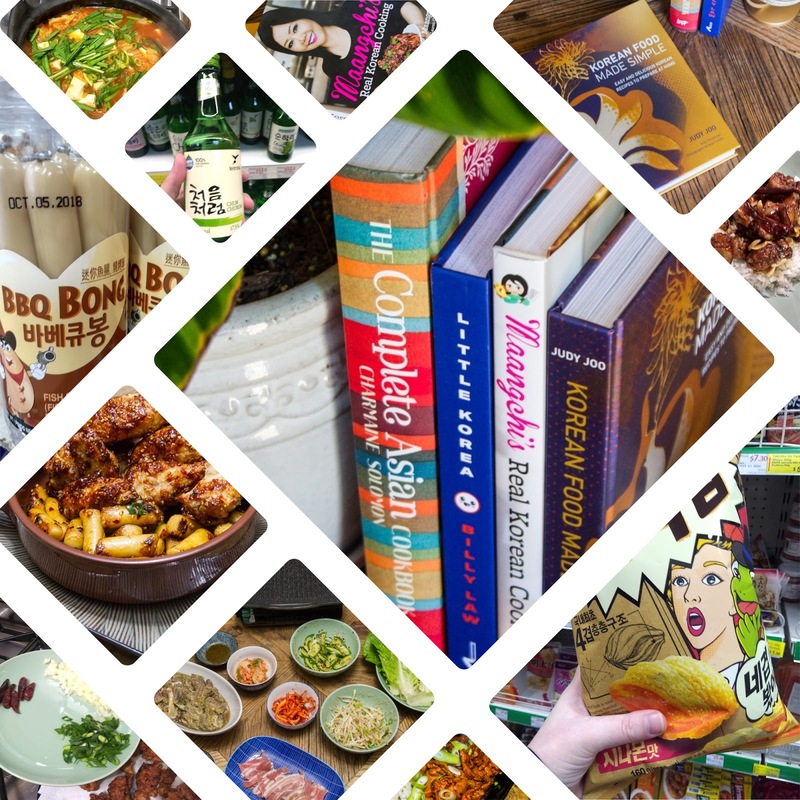 You will find a large reference section on Korean ingredients and where to find them which I referred to quite a bit when planning my menu and you will also find the largest selection of recipes of the three books, including some on the more intimidating side. I chose to cook the Bulgogi to go with the Korean BBQ I mentioned above. I have had a lot of experience with Bulgogi of the Costco variety. I love to keep it in my freezer as a go to on nights I want something quick. I knew deep down this is low quality Bulgogi. It is light on in seasoning and the meat is poor quality. This seemed like the perfect chance to try the real thing. With a nice hunk of high end sirloin I marinated overnight to impart deep flavour I was thrilled with the result. A good cut of meat makes all the difference and this was so tender and with the mix of pear, soy, garlic, sesame, honey, pepper and scallions it packed a lot more flavour than the ready made variety. Cooked fresh at the table, wrapped up in the cos lettuce and smeared with the spicy dipping sauce it was a fantastic meal. On to Charmain Solomans book The Complete Asian Cookbook. You might find a copy of this lurking around your mothers house, it's a classic and in it's day quite the work of art I would imagine. The Korean section is brief and a tad confusing. 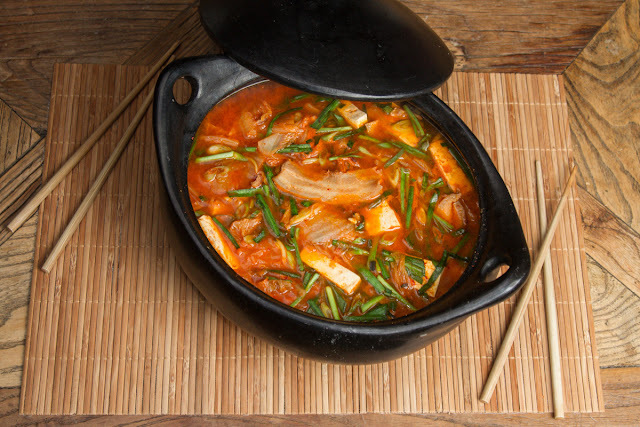 The recipes are very brief and lacking in the hallmarks of Korean cooking such as Kimchi. I always wonder with older books, if the disconnect is due to the fact the author had never been to the country or because they have adjusted the recipes to suit the availability of the ingredients at that point in time in the country the book was written for. I made the Beef Stew (Yukkae Jang Kuk) which involved slow cooking some beef and then stirring through a huge quantity of spring onions and some rice vermicilli. The end result was edible but the flavour combinations and the texture of the shredded beef and the rice vermicilli was a little strange. I haven't spotted anything like it in my modern Korean cookbooks and online the dish exists but not in the form presented in Charmain's book. So that one will forever remain a mystery to me but the whole purpose of cooking one cuisine for a week is to experience a range of perspectives on the food of a nation and Charmains perspective from a book written in 1976 is still relevant and worth exploring even if it is just a contrast to what is now available 42 years later and how much the world has opened up. How good it was. I ended up cooking Korean food for two weeks, not one week like originally planned and I ate leftovers every day and thoroughly enjoyed all of it. The usage of sesame oil. Almost every dish we made was seasoned with sesame oil and the banchan were nearly swimming in it. I started to love sesame oil after visiting China where it is the primary ingredient in a dipping sauce widely served with hot pot. Unfortunately my husband finds it over- powering and slightly offensive but he made it through the two weeks despite it's ample usage. Once I got going it was not that intimidating. I took a few short cuts like purchasing Kimchi from a Korean grocer and not making my own. I also picked up bellflower root that was already marinated and a ready to serve as a banchan. This was primarily due to the fact that I could not find bellflower root in any other form but it was delicious and saved me making another banchan when I was already committed to a number of others. I am a big rice eater and I normally stick to Jasmine rice with the occasional venture to Basmati for Indian cooking. The Koreans eat a short grained rice which I really enjoyed for a change. It is denser with a chewier texture and a little sticky. It pairs well with the robust flavours of Korean cooking. Finding new asian grocery stores in Canberra including a huge one specialising in imported Korean ingredients. We had quite the adventure here and tried some horrendously expensive imported Korean alcoholic beverages as well as some chips that tasted like McDonalds apple pies. You know you are onto a good thing when you are the only white people in a supermarket, especially in Canberra. Overall it was a very worthwhile two weeks. I have found dishes I would come back to again and again such as the pork and kimchi stew and the stir fried pork and I have stepped outside my comfort zone to find out that it's not really that scary on the other side. Sounds wonderful - glad the tofu was good.